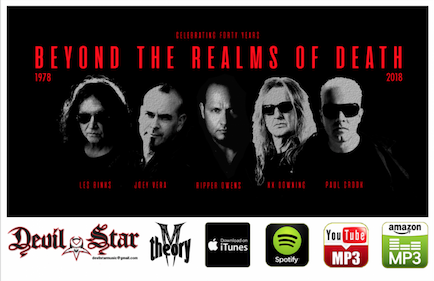 Due out digitally June 1 on all streaming/download platforms, “Beyond The Realms Of Death” was covered to commemorate the 40th anniversary of Stained Class, the legendary album on which the song originally appeared. In addition to Crook, DevilStar‘s rendition of the song features performances by three former members of Judas Priest – vocalist Tim “Ripper” Owens, longtime guitarist K.K. Downing and drummer Les Binks, who co-wrote the track with Rob Halford – as well as bassist Joey Vera (Armored Saint, Fates Warning). “Beyond The Realms Of Death” will be followed by subsequent DevilStar single releases in the coming months, which will be a mix of covers and original material that feature other notable hard rock/metal names, with Crook handling production and mixing in addition to playing guitar. While several tracks have already been recorded for release, fans are invited to email devilstarmusic@gmail.com to propose potential “dream team” lineups and/or suggest cover songs to tackle in the future. Crook first rose to prominence as lead guitarist of thrash pioneers Anthrax in the mid-1990s, when he performed on and toured in support of the group’s albums Stomp 442 and Volume 8: The Threat Is Real, the latter of which he also co-produced. In 1999, Crook began a five-year stint as lead guitarist for former Skid Row front man Sebastian Bach. For the last 15 years, he has served as lead guitarist of Meat Loaf’s Neverland Express and also produced the iconic vocalist’s two most recent studio albums. Still, Crook – who over the years has also collaborated with artists ranging from Glenn Hughes to M.O.D. – remains a hard rock and heavy metal fan at heart, and he founded DevilStar to serve as a supercharged vehicle through which he’ll exorcise his heavier musical demons.